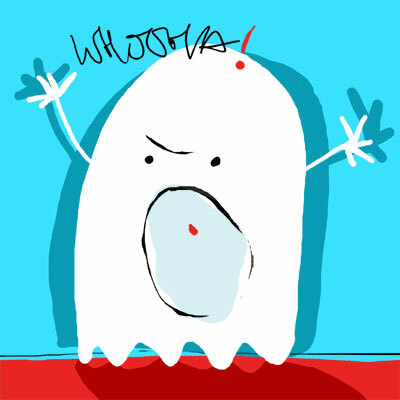 This ghost is trying to be spooky… but I think he needs to practise more. I wonder, do ghosts have shadows? I wondered that too, but put one on mine as well. Cute. This made me laugh! Very nice! I love the way you did the shadows and the colors themselves as well. Turquoise and red – too cool. Great lines on the face – simple and very effective. geen idee, heb nog nooit een spook gezien! nee, geesten hebben geen schaduw. So simple and so good. Love it!